A vision quest reveals a long-buried secret and sets Sophia off on an odyssey through the back pages of her own life. Ann is an unwilling passenger on this wild ride, holding on for dear life through the 50-year-long rite of passage from shame to freedom. This book is a work of fiction. However, it is based on women’s real-life experiences, fictionalized to develop the themes of transformation and spiritual growth. Kerani Marie is an inner-wisdom guide and the Soul’s Muse for women on the sacred feminine journey. With 40 years of immersion in multicul- tural spiritual teachings and healing practices, her wisdom is informed by direct experience with spiritual and healing crises. Kerani Marie’s authentic heart inspires the conscious emergence of souls through her writings, art, ceremonies and rituals. 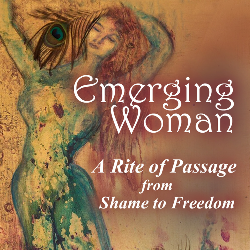 Cycle of Life Journey, published in 1998, and Emerging Woman - A Rite of Passage from Shame to Freedom. She currently lives in Sonoma County, CA. with her husband.